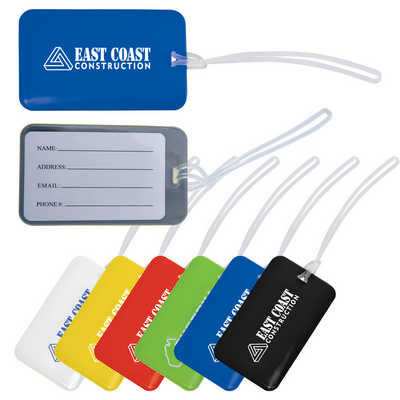 PVC luggage tag with clear spaghetti loop strap. Printed address label insert on back under clear PVC panel. Coloured front with grey back. Colours - Black, Blue, Green, Red, White, Yellow Size - 70mmL x 113mmH Decoration Area(s) - Screen Print : Front - Rectangle 55mmL x 80mmH; Debossed : Front - Rectangle 55mmL x 80mmH; Debossed and Ink Filled 1 Col White : Front - Rectangle 55mmL x 80mmH. Price includes : 1 Col 1 Pos Print. Setup is included.